Buy a gift that makes Baby play! ​Bring a soft, tummy-time friend to Play, Stow, and Go! 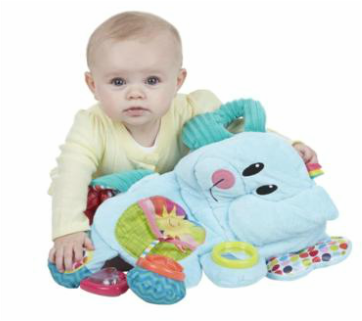 This busy elephant plush packs big fun with lots of colors, textures, sounds, and 7 activities for your baby to explore. Little ones can discover themselves in the mirror, squeeze the squeaker, shake the rattle, and much more! An easy-to-use, wireless infant movement monitor that fits to the top of the nappy. Featuring a sensitive tip that sits against the stomach, this product monitors abdominal movement, and if there are less than eight movements per minute, an alarm alerts you. Designed with various settings the alarm can be set for 15, 18 or 20 seconds. Gift the gift of rest. SleepBelt is a premium quality product designed for the 4th trimester and beyond. A hands free skin-to-skin support system and nap wrap, SleepBelt allows baby to sleep sound, snug and secure on mom or dad’s chest while giving parents their hands back.